Not in a Meatless mood? Add 2 cups cooked and shredded chicken for 18 to 24 shells. 1. Preheat oven to 350°. Cook the pasta shells according to package directions, drain, and rinse with cold water. 2. In a large skillet, heat the olive oil and add the garlic and red pepper flakes. Cook one minute, until the garlic is fragrant. Add the mushrooms and saute until the mushrooms are softened. Turn off heat and allow to cool. 3. Steam the broccoli until slightly undercooked then shock in ice water. Drain well and add to the mushroom mixture. Sprinkle with the salt and toss to combine well. 4. While the mushrooms and broccoli are cooking stir together the egg, cheeses, and spices. 5. Spread about 1/2 cup Alfredo in the bottom of a lightly sprayed 9×13″ baking dish. 6. 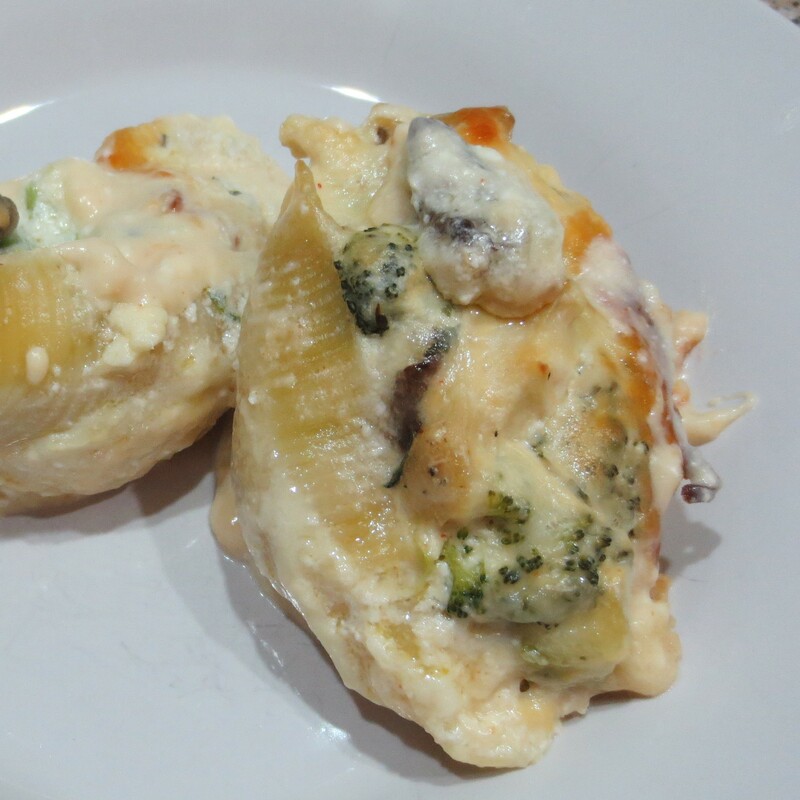 Combine the broccoli mixture with the cheese mixture and divide among the pasta shells and arrange in the baking dish. Pour the remaining sauce evenly over the top. 7. Cover and bake 20 minutes then uncover and bake 10 minutes more. Let stand 10 minutes before serving.